I was so excited when we received this in our Toys R Us box as I remembered getting one of these for Christmas when I was young!! Now obviously being the grown up that I am, I let Chick have it first and start it off. The idea with these is that you get a blackboard with a silver picture printed on it. The set comes with a scraper and the you scrape off the silver to reveal the lovely rainbow colours underneath and make a gorgeous picture. The problem that we had with it is with the scraper. It's made out of plastic and because the edges aren't sharp enough it's really very difficult to scrape off the silver. Also the black comes off too so its impossible to keep the edges neat and Chick got majorly frustrated with it and gave up!!! I carried on with it for a while and I have to say that I'm with Chick....it's REALLY frustrating........also very unhelpful when you have OCD!!! We finished it though and as long as you don't look too closely then it's kind of cool. Chick much preferred the spare blackboard that came with it although her designing lasted about 10 seconds before it was all used up!! This gets a 2/10 from Chick and unfortunately the same from me. 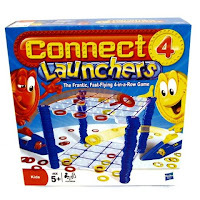 Available to buy from Toys R Us instore. If you already like Toys R Us on Facebook then please check out the new Toybox application where you can find all the latest reviews from the Toyologists. If you made it all the way to the end of the video then please excuse the state of me......I forgot in the excitement of winning that I was still make up free and in my PJ's!!! 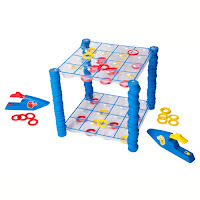 It's made from sturdy plastic and needs no batteries which is always a bonus!!! Available from Toys R Us at £16.99. With a plastic seat the perfect size for a bum! I have to admit to being a huge fan of these ‘make your own’ kits and I tend to buy them a lot for Chick’s friends birthdays. Mainly because they are reasonably priced, cute, easy to make and girls just love them so when I saw this in our Toyology box I knew it would be a big hit. It comes with a lip gloss base, colourings, pearlescent pigment to make everything shiny, 3 bottles, the measuring cup, mixing spatula and guide. It also has written instructions and a picture guide. These are super easy to make and Chick managed all on her own with no help from me. She had lots of fun making these and has been carrying ‘her’ lip gloss around in the pouch that comes with it. It’s also done the rounds of school and after school club so I’m sure that they are thrilled with me!!! The only downside for me is that it tastes absolutely disgusting but Chick gives it 9 out of 10 for fun!! Available in store from Toys R Us. Remember to head on over and check out the amazing new Toybox application where you can see all the reviews in one place. The instructions are pretty easy and it's cool that it comes with normal worded instructions as well as images, rather like an idiots guide which is very useful for Chick and I. The first 6 or 7 pieces of the puzzle are already assembled to make things easier for you. The next few pieces fitted in quite easily but they are some trickier ones as it's made of plastic and so they aren't so easy to fit in. Once you get used to it and you find a rhythm then they slot in pretty easily. I tried to take a picture of the numbers and arrows which point you in the direction of the next piece but the writing is just so tiny that my camera wouldn't pick them up!! 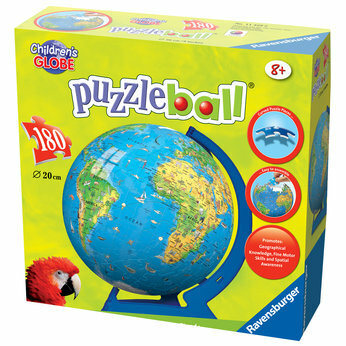 You can also obviously go down the traditional puzzle route and just look at the pictures! It took Chick about 35 minutes to get to this stage but mainly because we kept stopping to chat about the different animals and Countries on the globe! The last piece was definitely tricky to fit in but I helped with it and we managed in the end. I'm a huge fan of this product and cannot recommend it highly enough. We had a lot of fun putting it together and now that it's finished Chick is still looking at it and talking about it and it has in pride of place in her bedroom. It's aimed at ages 8+ which I think is perfect. Younger children would be able to manage but I think may find it quite difficult. 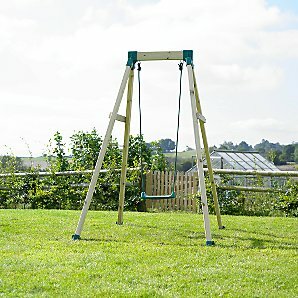 It retails at £19.99 and I will definitely be buying it for a few birthdays this year. 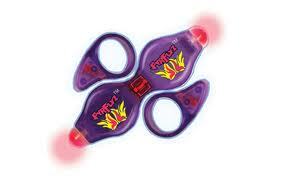 Fyrflyz are billed as a spinning light show, mixing art, fun and action! 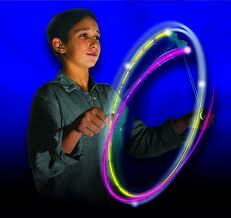 You can swing, spin and twirl them around to make a light show or special effects in your hands. Now being the internet savvy person that I am (ahem!!) I thought I'd better do some more research and sure enough if you check out Fyrflyz on You Tube there are much more co-ordinated people making the most amazing light shows. In summary these aren't for us.......but don't let that put you off what could be a great product for your kids. These retail at £7.99 which I think is quite reasonable and are aimed at the 8+ age range which is about right. Available online or instore from Toys R Us. When the lovely Alan from Vertbaudet contacted me to ask if I would be interested in reviewing an outfit for Chick, I nearly bit his hand off! We've been customers of theirs since before Chick was born and a good chunk of her baby clothes came from them as did some of her lovely nursery furniture. How cute does Chick look? Although obviously I am slightly biased!! The top starts at £16.00 and the jeans from £17.00 but they are both in the Summer Sale that is happening right now! 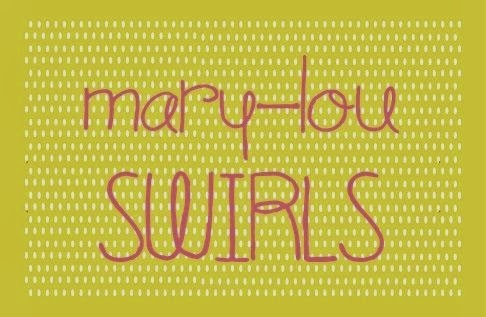 Go check out the website as I'm sure you'll find lots of items that you will love!! As you know we received our first Toys R Us box a couple of weeks ago and we've been busy playing, constructing, playing and filming the fun that we've been having in order to bring you some (hopefully) great reviews!!! To kick off proceedings I thought that we would start with a lovely giveaway!!!! 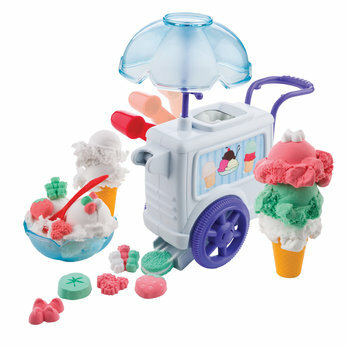 I have this fab Moon Dough Ice Cream Sundae set to giveaway! 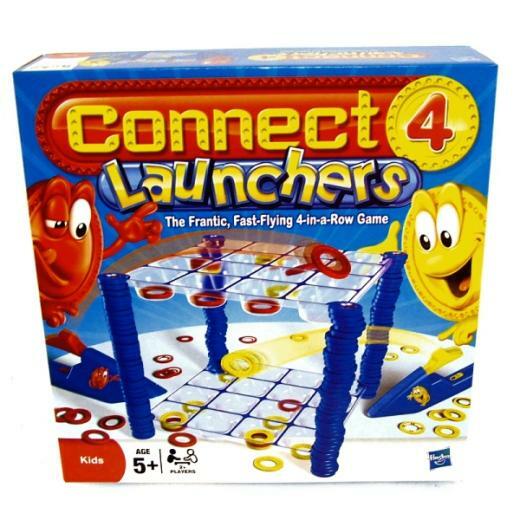 Unfortunately Chick thinks that she's too old to play with stuff like this now but I would still love to get my hands on some!! The cool thing about Moon Dough is that it doesn't dry out.....nothing worse than buying a similar product and finding that the kids have left the lid off and it's ruined. It's possible to stack it, cut it, mould it and stick it. Included in the set is a playmat, coloured dough, scoops, cones and moulds so that your kids can create their own ice cream sundaes. I love that it's so bright and colourful as well as unisex. 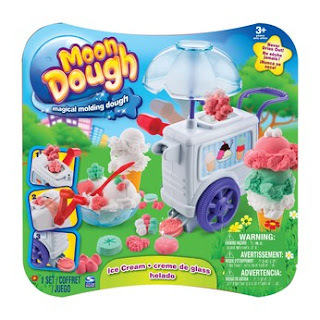 The Moon Dough Ice Cream Sundae set retails at £14.99 and is available to buy on the Toys R Us website. To review the toys last year we did slideshows, videos and written reviews but I would love to be a little more creative this year. So to enter it would be fabulous if you could leave me a comment with any great or creative ideas that you have for reviewing the toys. Alternatively you could just offer to review this and share it with us all!! You should also pop by the Toys R Us Facebook page to keep up to date with all the news, competitions and of course to check out some of the amazing reviews from the other Toyologists.